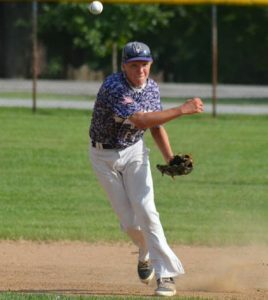 The Valmeyer Post 901 Junior American Legion baseball team went 2-2 in the state tournament played near Decatur over the weekend, placing third. Valmeyer ended its season at 30-15. Post 901 opened state tournament play Thursday in Forsyth with a 3-2 win over Decatur Gold. Jake Krekel went 3-for-4 with all three RBIs in the victory. Easton Wallace picked up the win on the mound with six strong innings. Cole Juelfs pitched the seventh inning for the save. Wallace also went 2-for-4 at the plate to help his own cause. Valmeyer played Alton on Friday, marking the sixth such encounter between the two teams this summer. Alton scored all six of its runs in the first two innings and made it hold up in a 6-5 win. Post 901 battled back after the early deficit, getting RBI hits from Philip Reinhardt and Andrew Whipple in the first inning, a Krekel sacrifice fly RBI in the second, a Kempfer RBI single in the fifth and another run in the sixth via a throwing error. But it was just not enough. Read the rest of this story in the August 3 issue of the Republic-Times. If you don’t already receive the paper, you can subscribe by calling 939-3814 or clicking here, or pick up a copy at any of these locations.